My last post here contained a factual error that has been pointed out by an alert reader. The post was about the building below, positioned on the corner of busy Stanley St and Vulture St at South Brisbane, just above Southbank. I thought that the original building on this site was a corner store - these were very common during the years prior to the development of shopping centres and supermarkets. A photo on the BCC web site was incorrectly labelled as being this site, and the unusual sharp-angled corner seemed to match. However, the shop photo comes from further west along Vulture St, and I have actually posted a piece on that shop before. Rather than leave the incorrect information posted, I have removed it. But what of this site? It was formerly a bank, a couple of readers indicated, perhaps built in the 1930s, which would certainly fit with the architecture. 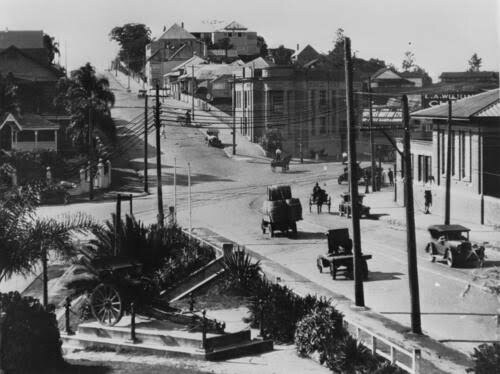 So far, I have not been able to identify the banking group concerned, but I have located a photograph at the John Oxley library headed "Mater HIll" taken around 1930, and I'm fairly sure that the building in the centre of the image is the one we are discussing. Memorial Park is in the foreground and the Mater Hospital at the rear. I am still searching for further details, and when I find more I will post it (FOUND - and posted here). I hate being wrong because it seems so careless on my part, but I am pleased that the error was discovered and brought to my attention so that it could be rectified. Thanks Katherine, I appreciate your comment. Even though it is uncomfortable, I would much rather have someone point out an error than not - then it can be corrected. I am pretty sure it was a bank. I used to catch the bus at the bus stop beside it in the 1970s.